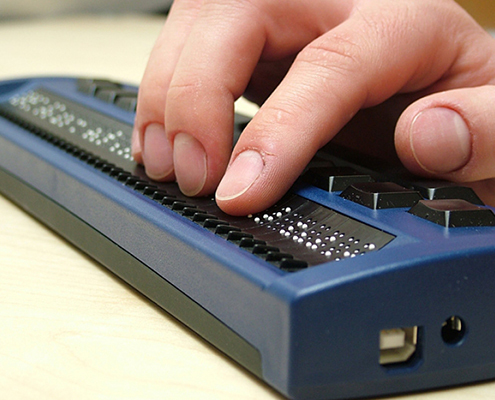 Despite its tiny size, Easy Braille Bluetooth is a complete Braille display. With its wireless Bluetooth connection, it can be connected to computers such as laptops, personal digital assistants (PDAs) or mobile phones. With its built-in rechargeable batteries, Easy Braille Bluetooth is perfect for the mobile use. 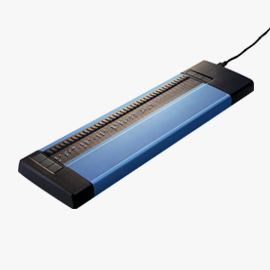 Easy Braille Bluetooth is equipped with 40 piezo electric Braille cells where each cell is equipped with a cursor routing key. 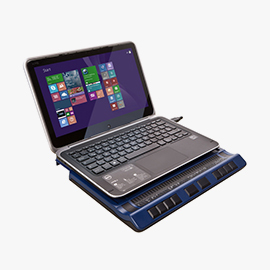 This allows to place the cursor on the reading position without the need of moving the hand from the Braille display. 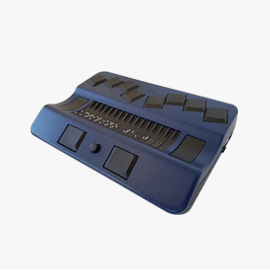 Beside the two navigation keys, the Easy Braille Bluetooth is also equipped with 8 function keys. The setting of the function keys allows to use them for Braille input. Easy Braille Bluetooth is ideal to be combined with PCs, laptops, PDAs, mobile phones or even with the reading system Sophie. Combined with PCs or laptops, Easy Braille converts screen information into Braille characters for the blind user. 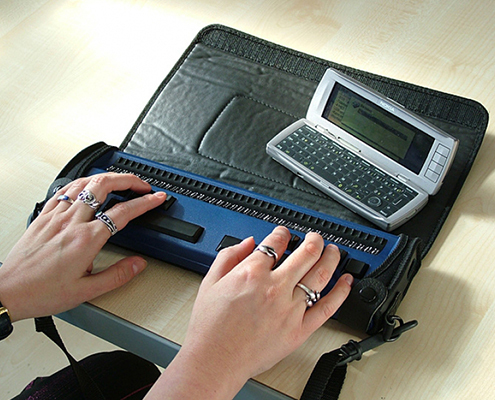 A so-called screen reader is needed to drive a Braille display also in the combination with speech output. 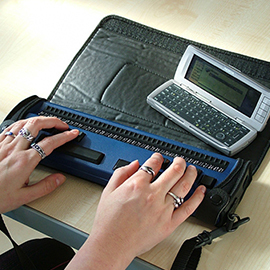 In combination with PDAs or mobile phones, Easy Braille Bluetooth can display text messages (SMS), phone numbers in Braille by being connected wireless. Even the mobile use of the Internet is now possible. Easy Braille Bluetooth allows also to enter text to be able to wireless control the PDA or mobile phone. Now you can write e-mails or text messages wherever you are – and for this, you can even keep your PDA or mobile phone in your pocket. 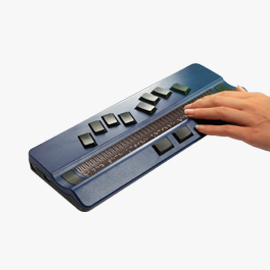 Easy Braille Bluetooth is ergonomically designed. It uses the unique Handy Tech concavely shaped Braille cells. 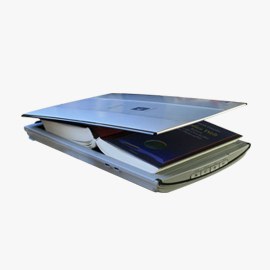 With its sloped backwards shape, it allows to read in a relaxed hand position. The navigation keys can be pressed directly with the thumb when reading. 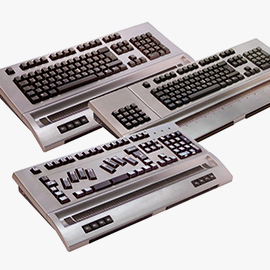 Also the function keys are ergonomically placed for input. Beside the Bluetooth function, Easy Braille Bluetooth is equipped with 4 rechargeable batteries (size AAA). 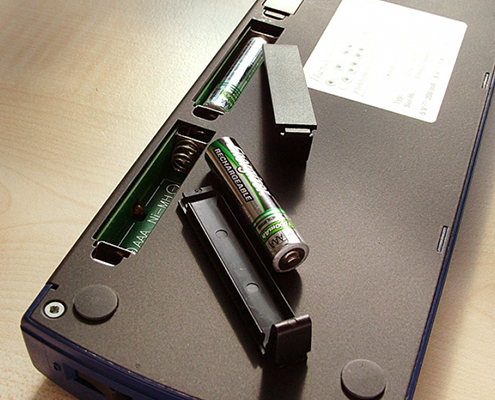 They are charged within the unit by connecting with the power supply. They are easy to exchange by the user.